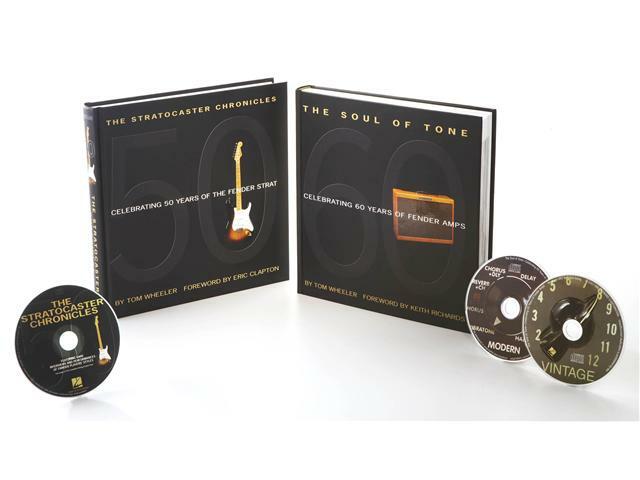 This beautifully slip cased set includes both hardcover books, The Stratocaster® Chronicles and The Soul of Tone. Celebrating the rich history of the world's most popular guitar and and the famous amp line, these books are the authorized accounts of Fender® by both the people who played them and those that made them. Full of lavish pictures, quotes, and facts from such notables as Eric Clapton, Keith Richards, B.B. King, Neil Young, Jimi Hendrix, Pete Townshend, Stevie Ray Vaughan, and even Leo Fender® himself, this wonderful set will appeal to guitarists, fans, and collectors. With the inclusion of 3 CDs featuring audio examples and interview excerpts, The Fender® Chronicles Deluxe Set will allow enthusiasts everywhere to fully experience Fender® history.